Our remote situation was getting out of control at our house! Now that baby Georgia is standing and maneuvering her way around the lounges, our remotes started... disappearing! You know how I feel about everything needing a proper home? Well, for us, the remotes just kept slipping under the radar - I did assign a coffee table, but it wasn't working, they were just thrown on there and then hidden under catalogues, magazines, etc. I've seen these online before and liked them, but never really thought to get one myself. So, in short - LOVE it! If you're looking for a remote control caddy and you like the look of this one, you can find it here - and while you're on the website, check out the brand new catalogue! Howards was kind enough to provide me with a gift certificate at the end of last month for upcoming projects I had planned around the house (thank you Howards!). 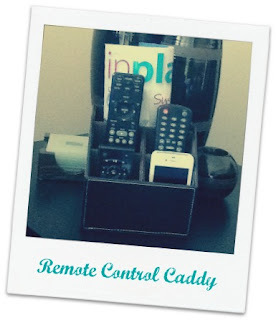 I hadn't even thought of using it for a remote control caddy until I laid eyes on this one - but I'm so glad I saw it, it's made such a great change!